This series has been on hiatus for a while, so, for those who do not recall, Signature Books has made this seminal collection of stories available free online. I have been reading the stories and posting about them. Together we share our thoughts and opinions. Today’s tale was also collected in Mortensen’s Back Before the World Turned Nasty which I read is at is best in describing place. 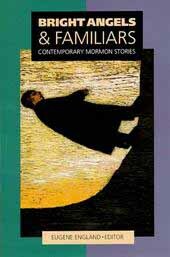 This particular tale is quite short (enough to be included on Everyday Mormon Writer). Go read it then return. Linda Sillitoe, who passed away recently, will undoubtedly be best remembered for her nonfiction, her journalism and her history. But she was also a poet and a writer of fiction, including two novels and today’s story (a quick read) about a woman who has lost her face saving her daughter from fireworks. She’s approaching the final skin graft of her hospital stay when she is approached by a troubled team with blue and orange hair, who needs a friend of a mother or something of her own. Strange that the world looked reassuringly the same although Lora Starkham would never look the same to the world. From the stocking-lined mask fitted over her face like a cat burglar, her gray-green eyes observed the traffic around the sunny atrium on the hospital’s seventh floor. She was newly grateful for her sight, for the fact that her eyes opened easily. She had been afraid for a time that her eyelids had melted, just as she knew the flesh over her cheekbones and chin had–we are, she observed wryly, clay after all. Welcome back! After a Bright Angels & Familiars hiatus (that we might better engage with Mormon Lit Blitz), we are picking up with a terrific story from Levi Peterson. Unlike his famous The Backslider, the hero of this story is not a dirty ole backslid cowboy but a rich stake president from the hills looking down upon Salt Lake City. Like the eponymous hero of Orson Scott Card’s “Christmas at Helaman’s House” (available in Dispensation and Keeper of Dreams), our stake president lives in the foothills, on the bench surrounding the Salt Lake Valley, among his fellow rich. In Card’s story, Helaman feels guilt over his wealth and comes up with a plan to share his largesse with the poor of his community. Sherman Colligan, on the other hand, and his stake have never thought to question the rightness of their dripping wealth. The poor must come to them, in the form of Rendella Kranpitz, before the poor become anything more than an abstraction. Before we get too deep into “Sayso or Sense” by Eileen Gibbons Kump, allow me to quote from the sixth page? But that night she had a dream. God was conducting priesthood meeting and Grandpa and Israel and the carpenter were on the front row, hanging on every word. God said when they came to earth, men could have their choice–sayso or sense–but they couldn’t have both because that wouldn’t be fair to the women. He called a vote and Grandpa’s hand shot up for sayso before God had finished speaking. Amy awoke, sure the choice had been unanimous. By daylight she had decided that, God approving, she had no alternative but to leave the men to their folly.